Cinnamon buns also known as cinnamon rolls are so good when they are hot and fresh you can bet on lots of ooey-gooey cinnamon bun icing being licked off your fingers. Typically cinnamon buns are a classic treat for families and although a cinnamon bun recipe may take some elbow grease the result is delicious. If you are a lover of cinnamon you will enjoy one of these cinnamon buns with a hot cuppa tea, coffee or even a tall glass of cold milk. I know you want to learn how to make cinnamon buns and today is your lucky day because that’s what I’m here to teach you. It was a baking day last night and on the menu was cinnamon buns. My husband had already started baking (yes he bakes too) and was making a double batch of rock cakes and cupcakes before he went out to run some errands. This evening there was nothing on television worth watching so I decided to go ahead and make these sweet-smelling cinnamon buns. These aren’t quick buns by any means because something this good takes time. It takes a while for the cinnamon bun dough as it needs to rise for at least an hour and half but it’s worth the wait as you can see how the photo details these gorgeous melt in your mouth cinnamon buns. 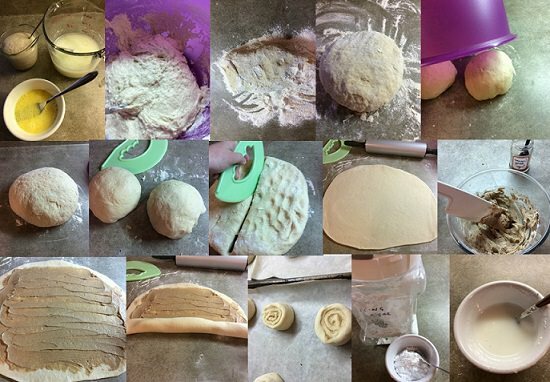 Two great things about this cinnamon bun dough recipe is that it can be used on its own for dinner rolls and that the dough recipe is from a friend’s mother who has used the same recipe for 40 years. You can’t fail with a recipe that’s been used that many times. Don’t get caught up in a fancy cinnamon bun recipe if you are looking for a recipe for cinnamon buns that won’t make you tear your hair out. This is a no fail recipe and if you follow the simple instructions you will be enjoying every last bite. Our entire home smells of fresh cinnamon buns and the boys want to gobble them up now but I’ve told them that they can have one for breakfast. It was my son Wilson who helped out this evening by cutting the cinnamon buns up and pinching the cinnamon butter. All of my kids enjoy helping me in the kitchen when they can as it’s a great learning experience for them. My son went on to say, “Mom, today you did everything by hand with no machines.” Yes I said, that’s the best way to do it! If ooey-gooey cinnamon buns are what you want to create in your kitchen this no-fail cinnamon bun recipe is for you. Enjoy! 1 cup icing sugar mixed until smooth with water. Scald 1 cup of milk and add sugar, salt and shortening and mix until melted. Put to one side and leave to go lukewarm. Meanwhile in ½ cup lukewarm water add 1 teaspoon of sugar and the active yeast. Let stand for 10 mins (keep at room temp) then stir briskly with a fork. Add to lukewarm milk mixture the softened yeast and beaten egg. Beat in 2 cups flour. You can use electric whisk until it gets too thick to mix. Place a cup of flour onto the surface of worktop and tip out dough kneading and working in the flour into the dough. You may need another cup depending on how wet the dough is. Place dough either back in bowl and cover with greased film or just turn the bowl over and cover with that. Let it sit for at least 1hr 20mins until risen and doubled in size. Punch dough down and place onto flour surface. Divide into 2 equal pieces and form each into a smooth ball. Cover and let rest for a further 10 mins. Roll out dough until large rectangle is formed. Mix together 2 teaspoon cinnamon, 2 teaspoons brown sugar, 2 teaspoons. Nutmeg and 1 cup butter until light and fluffy. Spread mixture on to dough and roll. Place onto parchment paper and press down lightly. Make sure they are close to each other as to not spread out and lose their shape. Place into pre-heated 170oC/ oven and cook for 15-20 mins or until light golden brown. Take out and mix together icing sugar and water until it forms a light paste. Cover in icing whilst still hot. Let cool and recover in icing a second time. I often get asked “How do you make cinnamon bun icing?” and it’s as simple as water and icing sugar mixed in a bowl to form a paste. 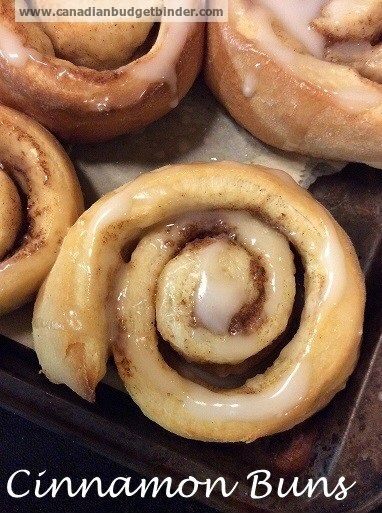 Once you take the hot cinnamon buns out from the oven slather them with some cinnamon bun icing while they are hot. You can add a further layer of cinnamon bun icing once they cool down as well. I hope you enjoy making this cinnamon bun recipe and let me know what you think but most of all enjoy the smells and memories while baking these in your home. Was wondering how much “g” is in a pkg of yeast that u use for this recipe? That’s great news Mary.. thanks for the review. I’m sure Nicola will be thrilled to read it. Guys I promise you won’t be dissapointed in these wonderful cinnamon buns/rolls and the dough is so soft and easy to stretch out when you are rolling it out just remember the parchment paper at the bottom of the tray when baking, as the butter tends to leak out a bit!. Clarisse your daughter will have so much fun! Oh Terry I remember Home Economics well. Let me know if you make these and if they are as good as the ones you made at school. Katrina they are good for making a big batch to freeze. Nicola I am drooling….I can’t wait to make these. Thanks! I learned how to make cinnamon rolls from scratch in my high school home economics class. I’ll never forget how much better they were than store bought rolls.I can still taste them!